As competition for residents and staff heats up among senior living communities, leaders of these communities are looking for ways to be more attractive within their market. Many have found that updating and refreshing their living spaces have prospective residents walking through their doors. Today’s seniors, often prompted by their baby boomer children, are seeking living communities that bring them personal comfort, often with a touch of luxury, rather than simply a place to live out their remaining years. We’ve compiled five of the latest senior living design trends that meet the satisfaction of today’s seniors and their caregivers. Create a sense of home. This has been an assisted living design trend—as well as a trend for most senior communities—for several years. What exactly do we mean by a “sense of home?” It means doing away with the institutional design of the past and replacing it with elements found in today’s upscale homes. Modern color palettes, finishes and materials give spaces warmth. Home-like atmospheres with artwork, fireplaces, high ceilings and cozy seating areas feel inviting for residents, staff and guests. Use biophilic design. Biophilic design brings nature indoors with the use of natural materials; live plants; large, high windows that allow sunlight to pour in; views and access to the outdoors; and art that depicts nature. The benefits of biophilic design for an aging population and their caregivers are numerous: it reduces stress, expedites healing, improves cognition and promotes socialization. Provide multiple dining options. No longer do seniors have just one option—the large dining hall—at mealtime. Senior housing architecture now includes a variety of spaces for differing dining styles. Cafés, bistros, bars and markets with flexible food service hours (much like a restaurant) are now all found in senior living communities. Community leaders have discovered that at a time when seniors may no longer find enjoyment in eating as taste buds become dull, allowing them to dine in a more stimulating environment brings back their joy of eating. Design for varying abilities. The goal of senior living communities is to help residents be as independent as possible to the extent of their abilities. Therefore, senior living design needs to be flexible and accommodating. Shorter hallways and bright lighting make walks less intimidating for those with moderate ambulatory issues. Proper acoustics can deafen the noise of high-traffic areas or areas with hard flooring surfaces. Residents who are able to push themselves in wheelchairs need to navigate corners easily. Memory care residents need free flowing space to walk, rather than hallways with dead ends. Design for staff. As we face a marked increase in the senior population in coming decades, the dire need for healthcare workers will continue. 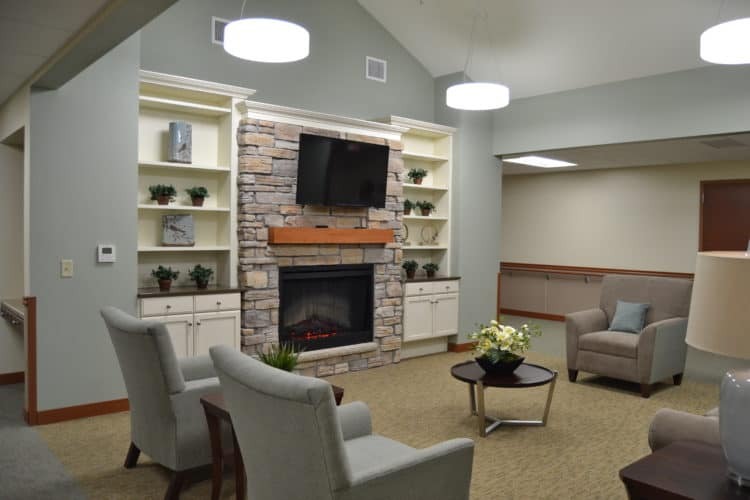 While many of the senior living design trends we discussed so far will attract employees, there are design and architecture elements you can incorporate specifically to show appreciation to staff. Lounge seating, sleeping rooms and full kitchens with a captain’s table for staff meals are among the elements being included in new facilities. Finally, our best piece of advice is to design for the future and changing trends. Your senior living community will last for decades and will need to appeal to new, future generations. By allowing for flexibility in your design, you’ll be poised to make updates and changes that meet the population’s healthcare needs of the time. If you would like to implement one or more the latest trends into an existing or new community, contact us or call (920) 969-9344 to ask about our innovative architectural design ideas.